Serco. Chances are you’ve never heard of the company. If you have heard of the company, chances are you misunderstand the shear enormity of the global company and their contracts. From transport to air traffic control, getting your license in Canada, to running all 7 immigration detention centers in Australia, private prisons in the UK, military base presence, running nuclear arsenals, and running all state schools in Bradford, Serco, somewhere, has played a part in moving, educating, or detaining people. New contracts awarded to Serco include a Saudi Railway Company, further air traffic control in the US and also IT support services for various European agencies. You can read more on their future projects here. Serco’s history began in 1929 as a UK subsidiary, RCA Services Limited to support the cinema industry. In the 1960s the company made a leap into military contracts to maintain the UK Air Force base Ballistic Missile Early Warning System. From there, the company continues to grow. Now trading as Serco Group, 2015 trading as of August 11 2015, maintained a revenue of £3.5 billion, and an underlying trading profit of £90 million. The data was presented at JPMorgan in London. 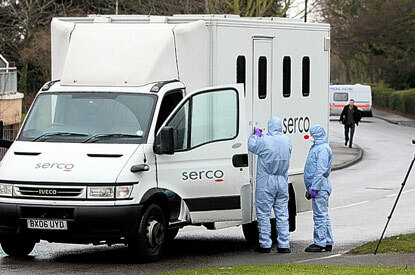 In 2013 Serco was considered a potential risk, and became a representation of the dangers of outsourcing. The U.K. government developed contingency plans in case Serco went bankrupt. When the concerns came to light, Serco faced bans (along with G4S, another outsourcing contractor) from further bidding on new U.K. government work for six months. It wasn’t until Rupert Soames OBE – Sir Winston Churchill’s grandson – took on the job as Serco’s Chief Executive in 2014, that Serco turned a new corner of profit growth. Seaport – The NAVSEA SEAPORT Multiple Award contract focuses on “engineering, technical, and programmatic support services for the Warfare Centers.” This is inclusive of Homeland Security and Force Protection, Strategic Weapons Systems, and multiple warfare systems. CIP-SP3 Services and Solutions (Cost $20 Billion, expiration date 2022) – biomedical-related IT services with the National Institutes of Health (NIH) with the main objective focused on Biomedical Research and Health Sciences extending to information systems throughout the federal government. Also implementation in several key areas of Biomedical Sciences including legislation and critical infrastructure protection. The few contracts listed above are among the vast array of transport, detention center and private prison contracts. This Article (The Biggest (and Possibly Most Terrifying) Company You’ve Never Heard of) is a free and open source. You have permission to republish this article under a Creative Commons license with attribution to the author AnonWatcher and AnonHQ.com. Geoengineering and Jade Helm – What’s the Connection? …….one more turkey to roast.